COBB Tuning Forged Pistons SUBARU - Dezod Motorsports Inc - Home of the automotive performance enthusiast since 2002. Engineered fully in-house, our pistons start life as JE low-silicone aerospace aluminum alloy forgings. From there, we CNC machine the raw forgings to our own unique design. While some features are more obvious to the eye than others. 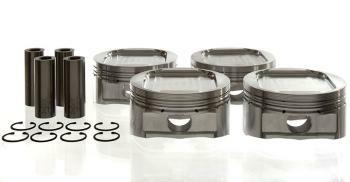 Pistons sold as set, includes heavy duty Chromoly piston pins and clips. Additional work required includes, but is not limited to, balancing with rotating assembly and boring the cylinder walls to achieve desired clearances. We DO NOT supply pistons to be used as “drop ins”. Subaru(STI) Ring Set – High Quality ring set featuring chrome plated top ring, ductile iron second ring and low-friction oil scraper design. Piston Coatings – Ceramic-based crown coating reduce heat loss and thermal shock improving power and reliability. Side skirts receive a dry moly film to reduce friction and piston noises and greatly increases cylinder life. Allows us to run tighter piston to wall clearance. Highly recommended, even factory Subaru pistons come coated!